It won’t be an understatement to say that the prevailing prices of pulses are at a reasonably stable level. 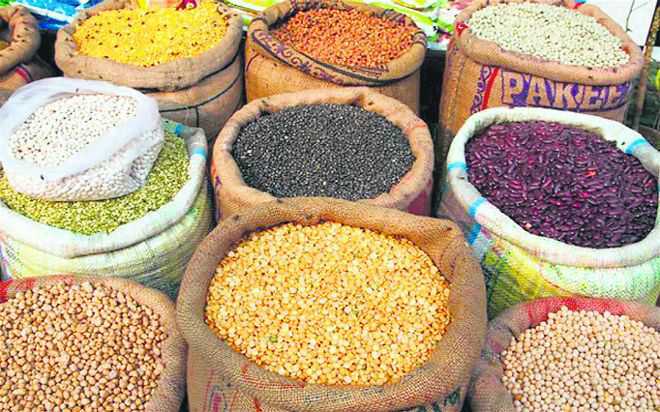 The prices of the five major pulses (tur, urad, chana, moong and masur) have been in the comfortable range of Rs 60-75 per kg for quite some time now, as compared to previous high levels of Rs 100-150 on account of lower production due to drought. Food inflation has been instrumental in containing overall inflation. The rate of Consumer Food Price Inflation (CFPI) has breached the 4 per cent mark only in two of the past 24 months. This can be attributed to bumper production of pulses and efforts of the government through the implementation of schemes — Price Stabilisation Fund (PSF) and Price Support Scheme (PSS) — towards the creation of a buffer stock of pulses and ensuring maintained availability. Coupled with a steady rise in per capita income, the stage is set for greater orientation towards the consumption of pulses, which also augurs well for a qualitative improvement in the diet. Recent government initiatives, including the MSP hike backed by the recently announced umbrella scheme — Pradhan Mantri Annadata Aay Sanrakshan Abhiyan — is also a shot in the arm for rural incomes. Thus, the macro variables being favourable, it’s time to invest efforts, energy and financial resources in achieving the long-term goal and vision. Elementary economics says that price is majorly the consequence of interplay between demand and supply. A basic study of the correlation between the production of pulses and their prices reaffirms that the latter is much influenced by the supply side as the demand is more or less increasing at a steady (and predictable) pace. Thus, it may be said that price fluctuations are largely the impact of production fluctuations. Over the past five years, production has recorded a low and high of 163.5 lakh MT (2015-16) and 252.3 lakh MT (2017-18), respectively. The variation between the two is around 90 lakh MT, which is about 44 per cent of the average production of the said period. The same period has also witnessed CPI inflation (pulses and products) peaking to 31.92 per cent at the trough of production and at a record low of (-)21 per cent at the peak of production of the period. Thus, stable prices may be envisaged as a consequence of stability in production levels. The objective of ensuring stability of pulse prices is rooted in curbing fluctuations in production levels. Price fluctuations in a given year may also be exacerbated by the seasonality of market arrivals. Hence, for stabilising prices, the supply side needs to be addressed. With stable prices, farmers benefit in the capacity of growers as well as consumers. Moreover, a decentralised approach may be more suited, considering the size and distribution of agricultural land in the country. The production of pulses in 1950-51, which was 84.1 lakh MT with an average yield of 441 kg/hectare, increased to 192.7 lakh MT with the average yield almost doubling (764 kg/hectare) in 2013-14. However, the picture is much more encouraging with respect to crops such as rice and wheat. For the aforesaid period, rice production has increased five-fold, with nearly four-fold increase in yield. Wheat production has increased 15-fold with four and a half times’ enhancement in yield. These trends have resulted in per capita availability of rice and wheat increasing from 58 kg/annum to 84.8 kg/annum and from 24 kg/annum to 66.9 kg/annum, respectively. However, per capita availability of pulses has dipped from 22.1 kg/annum to 15.3 kg/annum. A ‘Green Revolution’ for pulses is needed to regain ground. This is more so given the fact that global yields are about 1.5 times that of India, whereas productivity in Myanmar, China and the US is about 2-3 times more than that of India. Structural transformation of the economic activity i.e. shift from agriculture to manufacturing and service sectors will mean fewer hands feeding a greater population. Hence, it inevitably necessitates an improvement in productivity, given the natural resource constraints. The Economic Survey (2016-17) makes a key point. Revenue = Price (P) x Quantity (Q). Thus, gross remuneration to the farmer can be by way of influencing prices and/or quantity. In addition to laying suitable focus on the price aspect through the MSP, a greater push should also be given for increasing farmers’ incomes by making enhancements in ‘Q’. This may be done by encouraging and enhancing food processing (thus augmenting the value chain), research and development to promote staggering sowing, and hence outputs resulting in lower price fluctuations by smoothening market arrivals. Seed varieties that have a longer shelf life, take a shorter time to mature and can be planted in different seasons, soils and regions may also be introduced. This is where agricultural universities need to contribute in a big way. 25-27% India’s share of the total global production of pulses. The country is the largest producer and consumer of pulses in the world. 256.7 lakh tonnes Total demand of pulses and pulses’ products in the country (2017-18). 56 lakh tonnes Pulses imported from Canada, Australia, Myanmar, Russia, Ukraine, Mozambique etc. — The authors are Assistant Director and Junior Statistical Officer, respectively, Dept of Consumer Affairs, Union Ministry of Consumer Affairs, Food & Public Distribution. Views are personal.